Peter Rees continued his recent love affair with Oceanview Speedway by dominating the points charts when taking out the 2010/11 West Coast Superstock Champs on Sunday. Rees again showed the qualities required to win championships by putting his car in the right places consistently over the 3 heats. The weather was the other big talking point as the mercury soared during the afternoon with punters reaching for their sun umbrellas and track preparation staff doing their utmost to keep the track drivable. The Rees Engineering Services Ltd sponsored event drew a tidy field of 17 cars from around the lower North Island. Palmerston North were well represented with 10P Peter Rees, 8P Scott Miers and 32P Graeme Barr supplying the experience backed by 27P Philip Gargan and 88P Jack Miers. Hawkes Bay also had a good hand with 3NZ Murray Long, 16B Steve Jude and 28B Jason Palamountain. Stratford has 282S Phil Ogle heading their challenge along with 25S Wayne Moss and a newcomer to Oceanview 5S Nik Kiser. This left the locals who had their biggest turnout this season headed by 5V Darryl Taylor, 99V Richard Watkins and promising young tyro 51V Sam Doyle. 23V Scott Duncan and 35V Mick Paul rounded out the field. On paper, one had to like the chances of Rees, Barr, Miers, Long, Ogle & Taylor but such is the equalizing nature of the track one can't take anything for granted. 32P Graeme Barr jumped away early and was never headed although 10P Peter Rees chased him down to within spitting distance by race end. 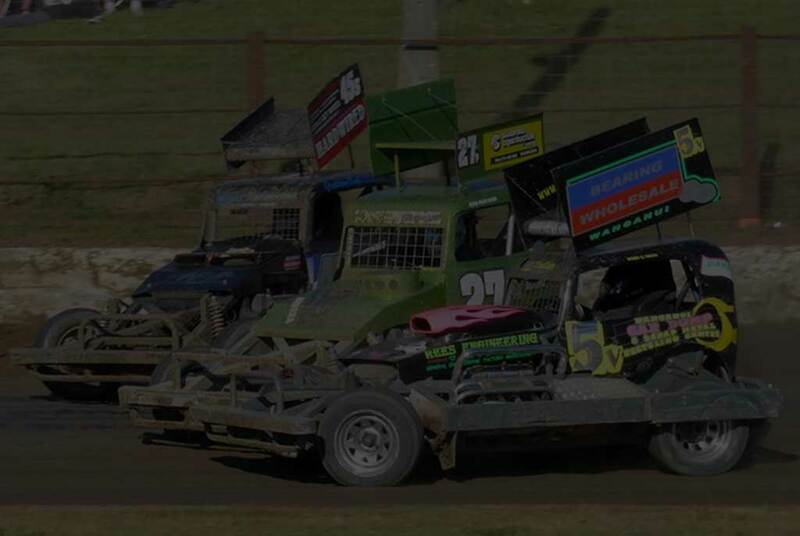 These two had a sizeable break on the remainder of the field headed by 28B Jason Palamountain. 51V Sam Doyle retired in a cloud of white smoke while 8P Scott Miers and 35V Mick Paul were non-finishers. This would leave Miers free to employ his usual destructive tactics. Round Two and it was Rees all the way as he careered away from the chasing pack, which was headed by Long and Miers. 45S Steve Guilford had hung in to be 2nd past the flag but he was later penalised two places after referees correctly called him for jumping the start. Barr had a race to forget, which would cost him dearly in the end. After two heats, Rees was sitting pretty on 33 points, Long had worked hard for his 29 points with Palamountain a surprise in 3rd on 27. With only 12 cars making the grid, the job for Rees looked simple. And so it turned out to be after seeing off the early attentions of Doyle, he settled in behind Barr to catch the easy road home to overall victory. A number of drivers were having trouble as the track started to slick off but Rees made no mistakes as he cantered in behind Barr. Earlier in the afternoon the 17 superstocks fronted the starters flag to race over 15 laps for the Noel Kensington Memorial Trophy. By lap two, Phil Ogle had inherited the lead and carried on to produce a stunning drive that bagged him both the chequered flag (by 10 sec) and almost the lap record, going within .23 seconds of that mark, which is held by Darryl Taylor. The 16.4919 recorded on the 9th lap had the ELS crew egging him on as he threatened to topple the target mark but with the track losing grip and the avoidance of lapped traffic hindered the final push. Result: 1. 282S Phil Ogle. 2. 10P Peter Rees. 3. 45S Stephen Guilford. 4. 16B Steve Jude. 5. 32P Graeme Barr. 6. 8P Scott Miers.